Container gardening with annuals is the answer if you want color quickly and plants that are long-blooming. They can be an important part of your container garden design. Even though they are the mainstay of blooming gardens, true annuals only live one season. They have to get started, flower, produce seeds and die in one blooming season. How sad – but they are great while they last. Coleus are beautiful annuals and are great grown in containers. Colorful foliage comes in all colors. Annuals give instant color – create contaiers of annuals, or mix them with your perennials. 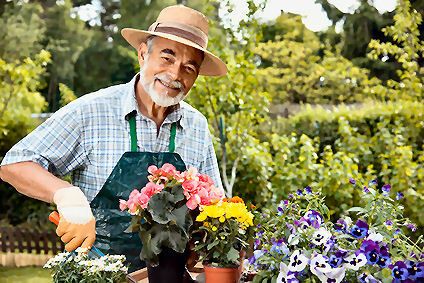 Other flowers that aren’t hardy are also sold as annuals – geraniums, impatiens and begonias are some of those. You generally have to replace annuals every year although you can bring some inside – begonias and geraniums – and they will live through the winter. I haven’t tried that with any other annuals. Annuals come in dozens of varieties – they may grow upright, in mounds, trail, climb or vine. They come in hundreds of colors and for all growing conditions. Many annual flowers prefer sun, but there are some that do well in shade. If you buy plants from a nursery, choose them carefully. You want to find green, healthy plants. Check the bottoms of the containers to make sure there are not too many roots coming through the bottom – you don’t want plants that are already root-bound. 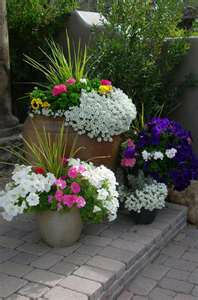 Container gardening with annuals will be more successful if you purchase your plants before they have bloomed. When I first started gardening, I bought plants already in bloom – I wanted them to make an impact and give color as soon as I got them in the ground. But, I’ve found that plants will do better if they are planted before blooming. Look for lots of small buds that are forming which indicates they will be blooming shortly. Check the labels on the plants to make sure they are going to meet your container needs in the long run – when they mature, will they be the right size? Do they need special soil – what are their sun or shade needs? You may also want to consider cost. The cost of container gardening with annuals can add up. Nurseries, garden centers and big retailers sell the same plants in lots of different pot sizes. A large plant may make an impact now, but that can be costly if you’re filling several containers. Several smaller plants in a 4-6 pack will give the same impact a little later, and cost a whole lot less. If you can’t plant right away, keep your new plants in a partly shaded area and water them frequently. Would you like to start your flowers from seed? 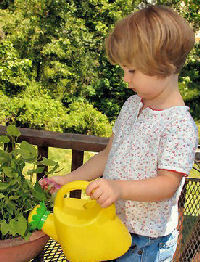 When container gardening with annuals, it is much less expensive to start your plants from seeds. For fast growing varieties, seeds can be directly sown into your container outside – just check the planting guidelines on your seed packet. 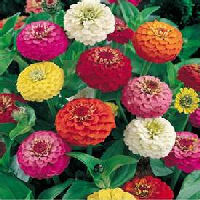 Zinnias are easy to start from seed. 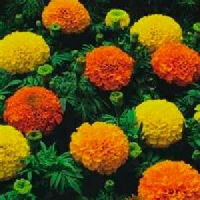 Marigolds are another annual that can be started easily from seed. Growing from seed can be rewarding and fun too – especially for kids – and it’s an amazing learning experience too. Check out my complete guidelines for starting plants from seed. Zinnias and marigolds (above left and right) grow quickly and are easy to start from seed. Annuals are grouped as hardy, half-hardy or tender. Hardy annuals – like pansies or ornamental kale – are grown for cool weather. Plant them in the fall and they will generally last until the following summer. Hardy types for summer blooming can be planted in early spring. Half hardy annuals – think alyssum or dianthus – can take light frost. Plant them in early spring. These annuals will be your first bloomers – late spring and early summer. Tender annuals – like impatiens, vinca and zinnias – can not take freezing temps at all. Plant in late spring, but only after all danger of frost has passed. Check labels for hardiness, or ask an expert at your local garden center. I like to plant in late afternoon, after the hottest part of the day. Water the soil in your container before you plant. 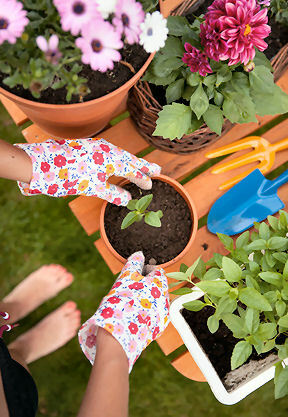 Remove the plants gently from the containers they were purchased in and either dip them in water or use a watering can to dampen their soil before you plant them in your pots. Try not to disturb the roots. If they are compacted loosen them gently before planting. Dig a hole slightly larger than the root ball, and set the plant , keeping the top of the root ball at the same level it was in its container. Firm the soil around the roots and water. Keep the plants moist until they are established and showing signs of new growth. Place your container where it receives 6 to 8 hours of sun a day. Many annuals do well in filtered sun or part shade, but there aren’t many that grow well in total shade. 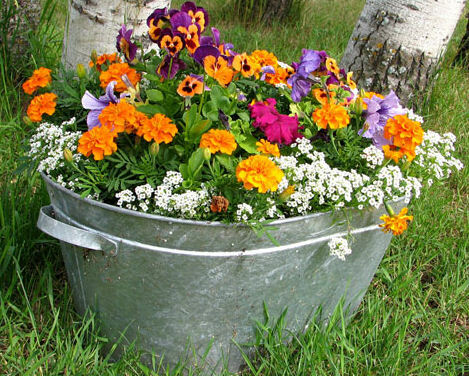 Container gardening with annuals won’t require a lot of fertilizer, but the plants will do much better if you fertilize them every few weeks. About fertilizer – because any plant in a container needs watering more than they would if planted in the ground, their nutrients will wash out of the soil sooner. Just be careful not to fertilize too much. Salts will build up in the soil and harm the plants. I either buy potting soil with fertilizer or add some granular kind to my soil when potting. Then, I use a water soluble fertilizer every couple of weeks when I water. When you water, water deeply to encourage deep root growth. Try to keep the foliage dry during watering. If you must use an overhead sprinkler, use it early in the day so the foliage will be dry by evening. This lessens the chance of disease. Don’t use saucers under your containers if at all possible. If you have to, empty them frequently – don’t let pots sit in water – root rot can occur. Make sure your container also has open drainage holes. Set up your own low cost slow drip irrigation system. It will make sure water gets to the roots and will help out if you find that can’t manage to water every day, or if you’re going to be away from home for a few days. If you live in a very dry, hot climate, or if you like to conserve water, consider container gardening with annuals that are drought tolerant. Some to try would be zinnias, petunias, globe amaranth, cleome and dusty miller shown below, left to right. If you live in an area that gets a lot of rain and your container soil stays damp, try fuchsia, pansies, or nicotiana, shown left to right, below. For areas that get lots of rain that keeps soil damp, try these bloomers. Adding an inch of mulch after planting makes the container more attractive and helps conserve moisture. Organic mulches are best – as they decompose, they will enrich your soil. When you do fall clean-up after your annuals are done for the season, keep the mulch to add to your potting soil for next season. Mulching will help weed control too. Container gardening with annuals pretty much eliminates weeding chores. However, pull any weeds that do come up in the container to keep harmful insects from invading the planter.